Spines is a common site of extrapulmonary Mycobacterium tuberculosis infection (MTI). Spine destruction due to MTI can mimic other etiologies. Treatment of choice for spinal tuberculosis (STB) is anti-TB drugs while surgery could be needed in other causes. The gold standard for STB diagnosis is histopathology examination from biopsy tissue. 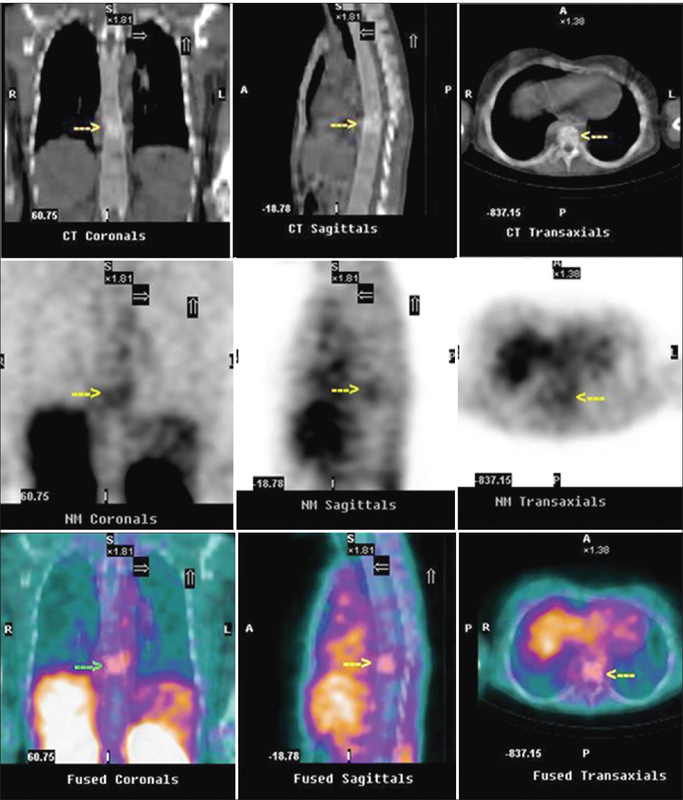 Technetium-99m-ethambutol (99mTc-EMB) scintigraphy can be used to detect and localize of TB. The aim of this study was to evaluate the role of 99mTc-EMB scintigraphy in STB management. Retrospective study was carried out from 2006 to 2014. Subject STB were patient STB with suspected of STB and underwent 99mTc-EMB scintigraphy. The histopathologic result was used as gold standard. Whole body planar acquisition was taken at 1 and 3 h postinjection of 370 MBq. Single-photon emission computed tomography/computed tomography acquisition was performed on suspected area. 99mTc-EMB image were analyzed by two nuclear medicine specialis. The 93 subject STB were included in this study. Histopathologic data were available in 40/93 subject STB. Positive and negative 99mTc-EMB scintigraphy were 32 and 8 subject STB. 99mTc-EMB scintigraphy result STB was concordance with the histopathologic finding in 37 subject STB. Sensitivity, specivicity, positive- and negative-predictive value, and accuracy of 99mTc-EMB scintigraphy 90.91%, 71.43%, 93.75%, 62.5%, and 87.5%, respectively. This study showed that patient STB with suspected 99mTc-EMB scintigraphy result could be directly treated with anti-TB. 99mTc-EMB scintigraphy has significant role in the management of STB. Tuberculosis (TB) infection remains a global health problem. It can involve not only lung but also any other organs in the body known as extrapulmonary TB (EPTB).,, Spinal TB (STB) is a common EPTB and remain a major health problem, particularly in the developing countries. The diagnosis of EPTB sometimes is very difficult since the symptoms of EPTB are not specific. It may manifest as fever, anorexia, weight loss, malaise, and fatigue. Sometimes, EPTB patient complain of only mild localized pain. Most of patients with EPTB came in advanced stage with neurological defisits or cold abscess (swelling without inflammation). Rapid and accurate diagnosis of STB is a cornerstone of the global TB control strategies. Many modalities can be used to diagnose STB, but every modality has its advantages, and limitations as well in diagnosis of TB. The final diagnosis of TB depends on Mycobacterium tuberculosis finding on either histopathological test and/or culture. Nevertheless, these histopathological test and culture may need between 10 and 14 days to get the results, and sometimes, it is difficult to get adequate specimen tissues. Nuclear medicine modality is a noninvasive technique, which is a quick, sensitive, and specific method to detect as well as localize the site of infection and inflammation at an early stage of the disease. A wide variety of radiopharmaceuticals are used, such as Ga-67 citrate, technetium-99m (99mTc)- ethylene cysteine dimer,99mTc-tetrofosmin, fluorodeoxyglucose-positron emission tomography,99mTc-methoxyisobutylisonitrile, and 99mTc-ciprofloxacin  not specific for TB. Ethambutol (EMB) is a specific anti-TB drug can be labeled with 99mTc. The aim of this study was to evaluate the role of 99mTc-EMB scintigraphy in the management of STB. This retrospective study was carried out in the Department of Nuclear Medicine and Molecular Imaging, Dr. Hasan Sadikin Hospital, Bandung. Subjects were patient with clinical diagnosis of suspected STB who referred for 99mTc-EMB scintigraphy were included in this study. EMB kit for 99mTc-EMB was obtained from Indonesion National Atomic Agency/BATAN, which consists of two vials. Vial A contains 0.7 mg of SnCl2. H2O and 35 mg Na - pyrophosphate and vial B contains 3.5 mg EMB and 5 mg of mannitol. A volume of 0.5 ml of vial A solution, previously mixed with 1 ml aquabidest, was added to vial B. Shaken until completely mixed. Then, 1 ml Na 99mTcO4 added to vial B, allow the solution for 5–10 min at room temperature with occasional shaking. The 99mTc-EMB purity was determined by instant thin layer chromatography examination using acetone solvent. The only radiopharmaceutical with purity >85% was used in 99mTc-EMB imaging procedures. There was no particular preparation for scintigraphy procedure. Whole body and single-photon emission computed tomography/computed tomography (SPECT-CT) images were taken at 1 and 3 h after intravenous injection of 370 MBq 99mTc-EMB. A dual-head SPECT-CT Gamma Camera was used with Low Energy High Resolution Collimator, energy peak 140 keV and window wide 20%. SPECT-CT was done in the suspected area of STB. 99mTc-EMB scintigraphy was interpreted visually by two nuclear medicine specialists. The image interpretation is as follow: (1) Normal scan, if there is no pathological increase uptake of 99mTc-EMB. Normal high uptake was seen in kidney and urinary bladder, liver, and spleen. There is the uptake of 99mTc-EMB in bone, bone marrow, and soft tissue. (2) Positive scan, if pathologic uptake of 99mTc-EMB were seen in the spine and gradually increased with time. (3) Negative scan, if pathologic uptake of 99mTc-EMB were seen which was increased at 1 h and gradually decreased (washed out) at 3 h images. Statistical analysis was performed to determine the sensitivity, specificity, positive predictive value (PPV), and negative predictive value (NPV) of 99mTc-EMB scintigraphy with histopathologic finding postsurgery as gold standard. [Table 1] showed the clinical characteristic of patients. From March 2006 and March 2014, there were 93 subjects who clinically suspected of having STB underwent 99mTc-EMB scintigraphy. Histopathologic data were available only in 40 subjects who included in this study. Positive and negative 99mTc-EMB scintigraphies were found in 32 and 8 subjects, respectively. [Table 2] showed characteristic of patients according to histopatologic result and 99mTc-EMB scintigraphy. 99mTc-EMB scintigraphy was positive and negative concordance with the histopathologic finding in 30 and 7 subjects, respectively. Only 2/32 (6.25%) subjects with positive 99mTc-EMB scintigraphy were negative histopathologic finding (false positive). While 3/8 (37.5%) subjects with negative 99mTc-EMB scintigraphy were positive histopathologic finding (false negative). 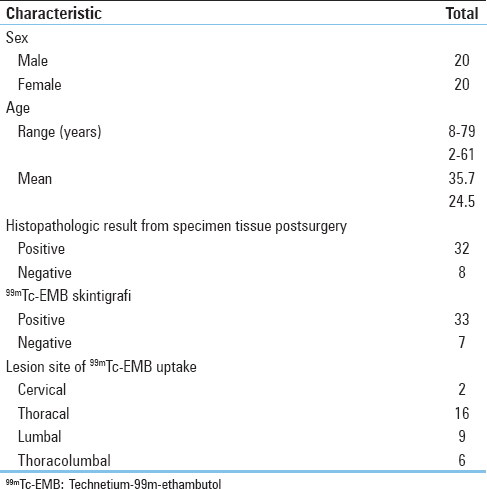 True positive finding in 27-year-old, female, with suspected of having STB underwent 99mTc-EMB scintigraphy and histopathologic procedure postsurgery [Figure 1]. Sensitivity, specificity, PPV, NPV, and accuracy of 99mTc-EMB scintigraphy was 90.91%, 71.43%, 93.75%, 62.5%, and 87.5%, respectively. This study showed the high PPV of 99mTc-EMB scintigraphy (71.43%). Based on high PPV, we could conclude that if a patient with clinically suspected STB had positive 99mTc-EMB scintigraphy, it mean that patient could directly treated with anti-TB drugs without cytologic diagnostic. Whereas if patient with suspected STB showed negative 99mTc-EMB scintigraphy, it mean others causes of STB should be considered. Others advantages of 99mTc-EMB scintigraphy are: (1) Noninvasive procedure. (2) Result will be faster than cytologic diagnostic. (3) Minimal or no side effects of radiotracer since dosage of radiotracer given to patients is only 2 mg dan excreted through the physiological process. This study showed that patients with clinically suspected STB and 99mTc-EMB scintigraphy result support the evidence of STB, could be directly treated with anti-TB regimen without underwent to the histopathologic procedure. This study has several limitations. First, we conducted the retrospective study, and therefore, selection bias should be considered in the interpretation of our results. Second, mostly patients included in this study had treated with anti-TB drugs <1 month before the time of 99mTc-EMB scintigraphy. Third, we did not consider the amount of calculated numbers of bacteria at the site of tuberculose infection at the time of imaging. 99mTc-EMB scintigraphy is a promising diagnosis modality for detection and localization of spine TB. Iseman MD. Tuberculosis in relation to humanimmunodeficiency virus and acquired immunodeficiencysyndrome. In: Iseman MD, editor. A Clinician's Guide Totuberculosis. Philadelphia: Lippincott Williams and Wilkins; 2000. p. 199-252. Dutt AK, Stead WW. Epidemiology. In: Schlossberg D, editor. Tuberculois and Nontuberculous Mycobacterial Infection. Philadelphia: W.B. Saunders Company; 1999. p. 3-16. Watts HG, Lifeso RM. Current concepts review – Tuberculosis of bones and joints. J Bone Joint Surg Am 1996;78:288-99. Sant M, Bajaj H. Role of histopathology in the diagnosis of tuberculous synovitis. J Indian Med Assn 1992;90:263-4. Seabold JE, Palestro CJ, Brown ML, Datz FL, Forstrom LA, Greenspan BS, et al. Procedure guideline for gallium scintigraphy in inflammation. Society of Nuclear Medicine. J Nucl Med 1997;38:994-7. Degirmenci B, Kilinc O, Cirak KA, Capa G, Akpinar O, Halilcolar H, et al. Technetium-99m-tetrofosmin scintigraphy in pulmonary tuberculosis. J Nucl Med 1998;39:2116-20. Bakheet SM, Powe J, Kandil A, Ezzat A, Rostom A, Amartey J. F-18 FDG uptake in breast infection and inflammation. Clin Nucl Med 2000;25:100-3. Onsel C, Sönmezoglu K, Camsari G, Atay S, Cetin S, Erdil YT, et al. Technetium-99m-MIBI scintigraphy in pulmonary tuberculosis. J Nucl Med 1996;37:233-8. Britton KE, Vinjamuri S, Hall AV, Solanki K, Siraj QH, Bomanji J, et al. Clinical evaluation of technetium-99m infecton for the localisation of bacterial infection. Eur J Nucl Med 1997;24:553-6. Verma J, Bhatnagar A, Singh AK. Radiloabeling of ethambutol using Tc-99m and its evaluation for detection of tuberculosis. World J Nucl Med 2005;4:35-47. Juwita R, Sugiharti S, Sumpena Y, Eka M, Kartini SN. Biological evaluation of 99mTc-etambutol for early detection of tuberculosis infection in animal model BATAN-Bandung. Indones Pharm Mag 2009;20:55-61. Sant M, Bajaj H. Role of histopathology in the diagnosis of tuberculous synovitis. J Indian Med Assoc 1992;90:263-4. Glassroth J. Diagnosis of tuberculosis. In: Reichmanand LB, Hershfield ES, editors. Tuberculosis. A Comprehensive International Approach. New York: Marcel Dekker; 1993. p. 149-65. Rooney JJ Jr., Crocco JA, Kramer S, Lyons HA. Further observations on tuberculin reactions in active tuberculosis. Am J Med 1976;60:517-22. Mikusová K, Slayden RA, Besra GS, Brennan PJ. Biogenesis of the mycobacterial cell wall and the site of action of ethambutol. Antimicrob Agents Chemother 1995;39:2484-9. World Health Organization. Treatment of Tuberculosis. Guideline for National Programmers. 3rd ed. Geneva: World Health Organization; 2003. Forbes M, Peets EA, Kuck NA. Effect of ethambutol on mycobacteria. Ann N Y Acad Sci 1966;135:726-31. Welling M, Stokkel M, Balter J, Sarda-Mantel L, Meulemans A, Le Guludec D. The many roads to infection imaging. Eur J Nucl Med Mol Imaging 2008;35:848-9. Das SS, Britton KE. Bacterial specific imaging. World J Nucl Med 2003;2:173-9. Takayama K, Armstrong EL, Kunugi KA, Kilburn JO. Inhibition by ethambutol of mycolic acid transfer into the cell wall of Mycobacterium smegmatis. Antimicrob Agents Chemother 1979;16:240-2. Causse JE, Pasqualini R, Cypriani B, Weil R, van der Valk R, Bally P, et al. Labeling of ethambutol with 99mTc using a new reduction procedure. Pharmacokinetic study in the mouse and rat. Int J Rad Appl Instrum A 1990;41:493-6.